(NaturalNews) If you're blue, can't seem to shed those extra pounds or suffer from malaise, you may be lacking adequate dopamine. As a powerful brain neurotransmitter, dopamine regulates movement, feelings of pleasure, cognitive ability and appetite. When levels are low, zest for life plummets and we become prone to neurodegenerative disorders such as Alzheimer's and Parkinson's - even schizophrenia. But not to worry. Keeping dopamine flowing freely is easy with a few dietary recommendations. High-quality protein - Foods that supply abundant amino acids, particularly tyrosine, are especially important for dopamine production. Good sources include organic turkey and chicken, fish, pastured eggs, wild game and grassfed beef. The omega-3 fatty acids found in wild-caught, coldwater fish are exceptionally beneficial. Fruits and vegetables - Help support stable dopamine levels in the brain with fresh produce. Look to quercetin-rich apples and folate-hearty, leafy greens, along with tyrosine-packed fruits such as bananas, strawberries and blueberries. Sulfur-containing foods like shallots, onions, chives, garlic and scallions, as well as collards, Brussels sprouts, cabbage and cauliflower increase glutathione in the body, which is necessary for dopamine release. Red beets contain both betaine (a compound that lifts mood) and tyrosine. Nuts and seeds - Give sugary and starchy snacks the boot and choose dopamine-stimulating nuts and seeds instead. Brazil nuts, almonds and hazelnuts supply plenty of amino acids for neurotransmitter function. Likewise, sesame, pumpkin, hemp and chia seeds are good options too. For ease of digestion and nutrient absorption, always use soaked, unpasteurized varieties. Tea and herbs - Bursting with polyphenols, green tea is one of the best foods for boosting dopamine. Beneficial herbs include ginkgo biloba, dandelion, ginseng and nettles, as well as fenugreek, red clover and peppermint. Superfoods and supplements - Used judiciously, supplements can strengthen neurotransmitter balance. Spirulina is an exceptional source of tyrosine, while oregano oil shows promise in soothing mood swings and food cravings. Raw cacao is another uplifting food, as it triggers dopamine release. Make sure you're getting enough vitamins B, C and E, folic acid and niacin. Minerals like magnesium and zinc are also important. And don't forget about lifestyle support, which keeps happy brain neurotransmitters circulating. Mild exercise, meditation and yoga all help to encourage a positive and bright mind. 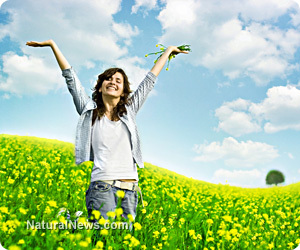 Finding pleasure throughout the day promotes healthy dopamine levels too.